@dougmillsnyt: President Obama walks with members of the Secret Service in Rome, NY. Can’t believe I’m first. Love TOD and the days of Obama. Can someone (BT) please put this up here? Thanks! Bob, I was delighted to see one of the comments on this article say that Issa is in trouble in his own district. If we could see the last of this weasel in November, it would be a glorious day, indeed. Awesome..and thanks for doing that:) Been hard at work today as it was the last day of school for the kids….we all have to pack up/move or classrooms…so needless to say, I’m exhausted and haven’t even had the time to peek in to TOD at all today. It is part of the Total Fail of our media that their focus has been exposed as nothing more than the kvetch of the day. “What can we critcize POTUS about today?” is what now passes for media news planning. That needed to be tweeted! Donna, you’ve been on fire since you got your tooth extracted–just one good tweet after another. I hope you’re feeling better. I am feeling better JG. How did you make out with your tooth today? I hope things went well! I’ve been bringing myself up to date on this VA situation. It’s an awful situation to say the least. There needs to be a thorough investigation and heads should and I believe will roll regarding what has taken place. With that said, it would not make a bit of difference or solved one problem facing the VA had PBO fired Shinseki earlier this week. The media, republicans and some democrats who always seem to take the path of least resistance are just simply looking for a sacrificial lamb. Had he fired him then the media and progressives would be all in an uproar that Shinseki was thrown under the bus. You see its always a no win situation for PBO. He expects people to do their job because when they don’t it all falls on him. Sometimes I wonder why he even bothers. For our sake I am grateful that does. Donna, I believe our president doesn’t give up on good people until he’s given them every chance. He respects and admires Shinseki and he will make sure he has an opportunity to redeem himself. Like a true leader, he seeks the facts first and that’s the mission going on now. Once he knows the full story and all the facts are presented to him, he will make the right decision about whose head rolls and what happens next. Hotheads who fire first and think later are a dime a dozen in this world and they are not leaders–they are knee-jerk reactors. Naturally all of the president’s critics think he should be a “reactor,”because they refuse to recognize real leadership when they see it. One of the things that I love the most about PBO is that he doesn’t allow the media or the Repubs to dictate to him what he should do. It drives them crazy and I love watching it!!! I just signed on and looked over your posts for today. An abundance of informative news, pictures of the President and First Lady, videos. Oh, my! I’m going to have to leave for awhile and I hope I can come back, open up the posts and read the comments. I have a couple of things to mention in case I don’t get back. I read about Leader Pelosi’s appointments to the Benghazi committee and was relieved. I like the military experience/oversight in the group. I think these choices will be honorable, honest, and able to hold their own quite well. We know the GOP is going to go overboard and the Democrats will shine. @NoShock @TMZ_Sports PBO: "When ignorant folks want to advertise ignorance you don't really have to do anything you just let them talk"
Oh, I love you women! And we ❤ you back. WOW. President Obama walking down the street. Wow. I felt as excited as that woman in the video. ….When Justice Stephen G. Breyer talks to a room full of law students, he knows exactly what they’re thinking. They think we’re just “junior varsity politicians,” he told audience members Tuesday night, and he warned that politicization of the legal profession could have serious consequences. Breyer’s freewheeling remarks—somewhere between a Q&A and a conversation between colleagues—came during the American Law Institute’s annual meeting, where he joined outgoing Director Lance Liebman to discuss the state of the legal profession and share some laughs and Restatement war stories…..
Breyer’s view of the legal profession is organic, with the judiciary, academia and practitioners all playing their individual parts, but ultimately working together to keep the law moving forward. First, there are the judges, who—in his words—aren’t experts on much of anything. They make decisions and issue opinions.Those opinions are read and interpreted by law professors and academics who analyze them and decide which ones have value and which ones should be reexamined and challenged. Practitioners then take that scholarly work into the courtroom and incorporate it into legal briefs. Judges read the briefs, and the cycle starts all over again, Breyer said. But he also spoke of an undercurrent of politicization creeping into the system and gumming up the works. While law schools have changed for the better in one respect—”you find good teachers everywhere,” Breyer noted, not just the top 20 law schools—the biggest problem for “our court,” and for plenty of state courts is that today’s students see judges as wannabe or minor-league politicians, he said. Fading is the vision of law articulated by Potter Stewart that the mark of a top notch legal opinion is that you can’t tell if it was written by a Democrat or a Republican, a man or a woman, Breyer said…….. I saw Million Dollar Arm this weekend and loved it. It’s uplifting and inspiring. “The film is based on the true story of baseball pitchers Rinku Singh and Dinesh Patel who were discovered by sports agent J.B. Bernstein after winning a reality show competition.” (Wikipedia) When the credits were rolling they had pictures and videos of the real Singh and Patel and they had pictures of them meeting President Obama! He obviously hosted them at the White House. I love that 2014 vote poster of President Obama. I have one from 2012. It’s very large and I don’t have it up on the wall, but it’s one of my favorites. Gotta run. I may be back in a few minutes or later I hope and catch up with all the news. ….”There was a change at that point in time from taking whatever the government could build in the way of security equipment … to a guy who said, ‘ya know, I’m used to using this, this is great, I’ve got to be able to take advantage of this,” George said. At the time there were only about ten phones that the president could contact directly on his device, but that didn’t make the technology simple to develop. Both phones would either need to have the same encryption algorithms or use a gateway that would decrypt and encrypt the communications. That means the phones needed to speak the same secret language or have a translator fluent in both of their secret languages….. I made @BarackObama's @BlackBerry http://t.co/UTzBSXTqj8 #NSA engineer describes effort to create a secure BB & his role in the "Red phone"
George also had a hand in creating the famous “Red Phone” early in his career. The phone — which was not actually red — provided the president with a secure connection to the Kremlin in Moscow. For the Red Phone, George’s team determined the encryption algorithms. “The problem [was]…we didn’t want to put our best classified algorithm in, cause you’re giving it to the Russians. “That is, it needed to be secure, but not too secure. It also needed to function properly every time the president picked it up…..
Love these little gems you dig up, LP. You are very much appreciated!! The picture of the women’s baseball team brought back a warm memory for me. We lived in Chicago right after World War II. The women’s teams were still playing professionally. My parents knew a young lady who played for a team that was in town, so we went to Comiskey park and watched this young lady play baseball. Seemed very ordinary to me at the time. There were active leagues of women baseball players during World War II. However, the fifties soon put a stop to that! Cooperstown is an absolutely beautiful place. We included it in a college study tour about 12 years ago. The museum was so much smaller than I expected, but very intimate and atmospheric. The trip from Boston out through western Mass, to Cooperstown was absolutely gorgeous. This was in May, and flowers were everywhere! Then, on the way back to Boston we stopped at Hyde Park and visited FDR’s home. That was moving. His personal library is one of the most wonderful rooms I’ve ever been in. In 2011, actress Lynda Berg didn’t make enough money to qualify for health insurance through her union. And, on her own, she had trouble finding a plan she could afford because she’s a survivor of breast cancer, considered a preexisting condition. The uncertainty of not having a health plan was stressful and at times expensive, she recalls. A few years ago she fell and broke her hand and elbow and ended up paying $4,000 for her medical care. But all that has changed for Berg, 59. In March, she went online, signed up for a policy through Covered California, the state’s new health insurance marketplace set up under the Affordable Care Act, and now is getting medical care. More than most people, workers in the area’s vast entertainment industry are poised to benefit from the federal health law. But as the new law takes hold, the massive overhaul has also stirred up considerable confusion and anxiety over how to navigate a host of new healthcare options. For decades, artists have flocked to the state, and many have just scraped by while trying to get their big break. According to a study from the National Endowment for the Arts, California has the highest number of artists in the nation. The same study found that more than 30% of artists are self-employed compared with 10% in the general population, and rates of uninsured are typically higher among the self-employed than others. Thought I’d pop in lay some off-topic madness on ya! You must read some of the responses to this tweet! Hilarious! Some people are simply from a different world. Why would I be near any python? On another note, this pic might scare Donna!! I see that now. Very sorry. No snakes on TOD. Got it. No Dam Thank You !!!!!!!!!!!!!!!!!!! We have a little tag team action going on here. I say, GO FOR IT. Meta, this is too confusing for me. Is Sen. Reid threatening the GOP? Yes! He’s beginning to underscore a specific timeframe within which they can act on reforming the immigration system. He’s signaling to the GOP that the window is closing and he’s giving POTUS all the leeway he needs to enact via executive order, the thing the GOP fear most because it will contribute to their shellacking in the midterms. Yes, this is what it’s all about. Thanks, LH! I thought they were running away from PBO? speaking of Ireland I mailed out the magazine to Henry today. Postal employee told me it will take a week or two to arrive which surprised me. That’s brilliant Vicki, he’ll be thrilled! Yeah, there can be weird delays with post between Ireland and America – I once had someone send me a package from Sydney to Dublin and it took two days! This is one of my very fondest memories of PBO’s presidency. It felt like a birthday present to me. Mine too! I feel almost feel as I was there with them. What a magical trip that was! Hahaha, no! It was last week. So the way I celebrate is to let everything sort of run together for several weeks. Heh. So sorry I missed it (duh!). Happy belated birthday, two weeks running! Aw I missed it too! I swear we have had more snake pictures on this site in the last week then I’ve seen here in 4 years. Y’all know I’m terrified of those horrible creatures. I HATE snakes! Yes, I used the H word. Have to skip by that picture really FAST!!! I would appreciate it if no more snake photos appear on TOD. Yuck. This is the site I come to to feel safe. Not suggesting a ban, just a request. Okay. Didn’t that was a “thing”. Crikey, major snake-fearing going on at TOD! Sorry. I don’t like ’em either. Hmm clearly I’ve missed some stuff. Will keep that in mind though! Hadn’t post in awhile. But I sure hope folk would overlook this statement by him. Anybody is better than all of the suffering under Rick Scott any day, any hour of the week. 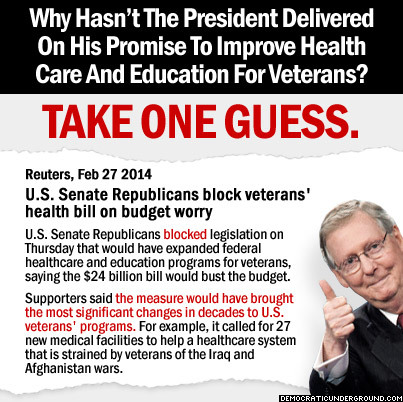 Surely he will not lose an election on a lack of understanding concerning the VA problems which the Repubs caused. Floridians will give Charlie Crist a pass on this hiccup. Do hope you are right – it seemed a stupid idea to buy into the discussion until more information is available. I know that all creatures are part of our earthly ecosystem……But I must confess. I am scared of snakes. I don’t like them. They give me the creeps. Seeing that many pythons on a human being makes me sick. 🙂 You’re such a baby!!! I've breached the 4K follower milestone. Thank you to all you wonderful Tweeple. One of the margaritas I have this weekend will be for you. 🙂 We thought the same thing. Why am I NOT surprised?! I think I’m going to need a glass of wine tonight. What a week. OOOHHHHHH, my heart is MELTIIIINNNNGGGGGGG. A most astonishing moment. We love you, Pete!! I’m off to bed. It’s still light outside (6pm) but I’m done for…see you all tomorrow. Behave and no more snakes. Not fond of them. Okay no reptiles here… Just one immensely cool President! “That cannot happen in this election because the stakes are too high,” said Obama about too many Dems sitting out the midterms. Great job tweeting today, DD! Don’t wish any more dental recovery on you but so glad you’re home!! Thanks meta. It’s been fun. I wish I could do it more often. I am completely on the mend and plan to go into work tomorrow. Addressing 100 Dem donors paying between $1,000 and $32,400 each, Pres Obama said "it''s not good enough to sit back and simply complain. See Hillary and Bill ought to be going around encouraging Dems to get out to vote 2014. @CharlieCrist – Your gop undie is showing, charlie. #getafuckingclue. Get thee to the temple! GET THEE TO THE TEMPLE!1!1! The worst sentence evah. dems are sitting out the elections. Pursuant to maintaing and adhering to our key principle of “safe space for all inhabitants herein” — There’s a motion on the floor to certify the Republic of TOD-landia de Blogosphere, the planet’s first official Creepy-Crawly-Heebie-Jeebie Free Zone! I was seven years old and we lived in NYC. For days I smelled a godawful stench. At first the family didn’t smell it, but eventually they did. We tore up the apartment trying to find its source. We finally found it: a dead rat in a closet. Ah, New York: city of dreams. Okay Chips consider this…snakes eat rats and mice so technically they say you are what you eat…. How very Putin-esque of you! Uh, y’all ~ these are just pictures of reptiles resembling snakes, they are not actually truly really snakes. Hello. Well, maybe i was a little hasty. Apologies. Those who enjoy snake photos go right ahead. I can scroll past quickly. Same thing I’d do if there was a large picture of sarah palin. President Obama has, and continues to do, an astounding job of restoring the moral authority of the USA. Fact is, he would have been in a vastly stronger position regarding Russia’s criminal actions in Syria and Ukraine, and in his efforts on Iranian nukes and the Israel/Palestinian conflict, and much, much more, if George W Bush, had acted swiftly and responsibly in Afghanistan and if he had not LIED to the entire world in order to illegally invade and occupy Iraq. I can assure you that had McCain or Romney been elected the US would have remained in Iraq irrespective of the consequences. Wow, Jorge Ramos came on like gangbusters tonight on Rachel, blaming PBO for deportations and immigration. And he went after Boehner too for not doing anything about Immigration. Yes, after Bohner pretty much blew him off and blamed PBO, he went after PBO. Which is why I said earlier today that I am no fan of his. He is very aggressive in most interviews. I’m glad he took it to Boehner in that news conference today but I am not surprised to hear that he took this position against PBO. This is typical rhetoric from him. That dude is a virulent #NEWSTAINER exploiting the suffering of immigrants. He demonstrates ZERO understanding of the RULE OF LAW. I don’t know that much about him and he is a part of the establishment MSM for the most part but my guess is he’s trying to pressure PBO into action. I know that’s absurd given the circumstances and our President’s well-established consciousness on the subject but I think that’s what we’re going to be seeing in the weeks ahead. MSM spoiling for a fight. The stakes are VERY high.